The 7 in 1 Smoker® / Grill by Masterbuilt is perfect for all your smoking and grilling needs, providing you with 7 features in 1 unit. You will be able to Grill or Smoke with Propane or Charcoal, use it as a deep fryer for those holiday turkeys and boil and steam vegetables. 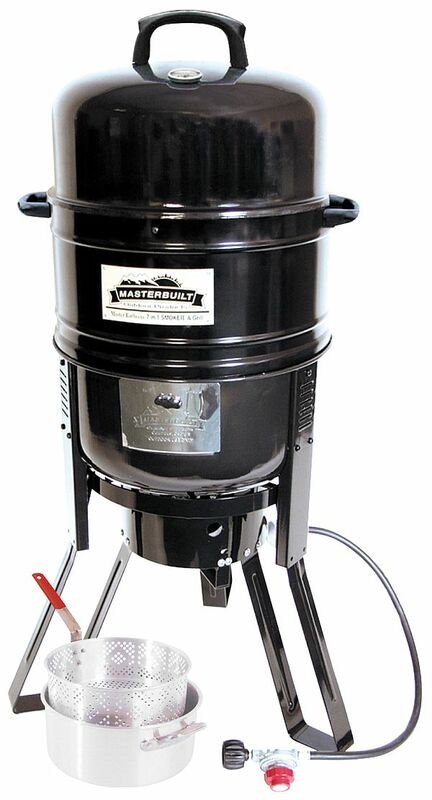 The Smoker/Grill is light weight enough to take with you on those camping trips also. This Black grill/ smoker/ cooker system comes with a porcelain flame disk bowl, a black solid steel 19" LP gas cooker stand and cast iron burner with type 1 regulator and hose. It also comes with a 10.5 quart aluminum pot, bucket with drain clip and thermometer. Featuring Cool to the touch handles and a built in temperature guage, this unit is so versatile you may never need another Grill, Smoker or deep fryer.